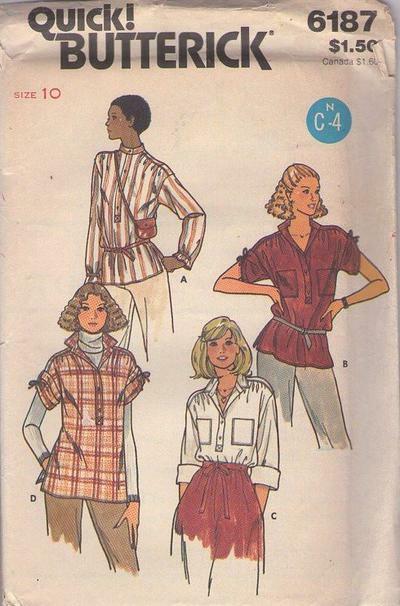 70s Disco, Retro Office Clothing Patterns - Very loose fitting top has front and back gathered into one piece shoulder yoke, front buttoned band closing, side hemline slits, edge stitching and topstitching. A; has band collar and full length straight sleeves with self loop and button closing. B has band collar, patch pockets and elbow length sleeves worn rolled up with attached self ties. C; has pointed collar on band, patch pockets and full length straight sleeves worn rolled up. D: has pointed collar on band and elbow length sleeves worn rolled up with attached self ties.